I should have done this months ago, but I’m finally starting to organize the thousands of stickers at home, as well as the stickers in the digital database (numbering ~2,000 at present, with several hundred or possibly another 1,000) to add later/soon. Now that I’m using the CONTENTdm software in their “Project Client,” I can add multiple items more quickly, and, even better, I can add columns of metadata related to the items (stickers). Pretty exciting from the kitteh perspective! I’m also creating an Excel worksheet to keep track of workflow, with a current total of 11 columns, including: file numbers, source, total number/format of image files per folder, archived in mylar pockets?, where are sticker notebooks? loaded into CDM?, temporary location of image files, image modifications before archiving?, location of archived image files, and back-up location of image files. The whole thing is starting to get out of hand, so if I don’t start to take care of it now, I’m toast. 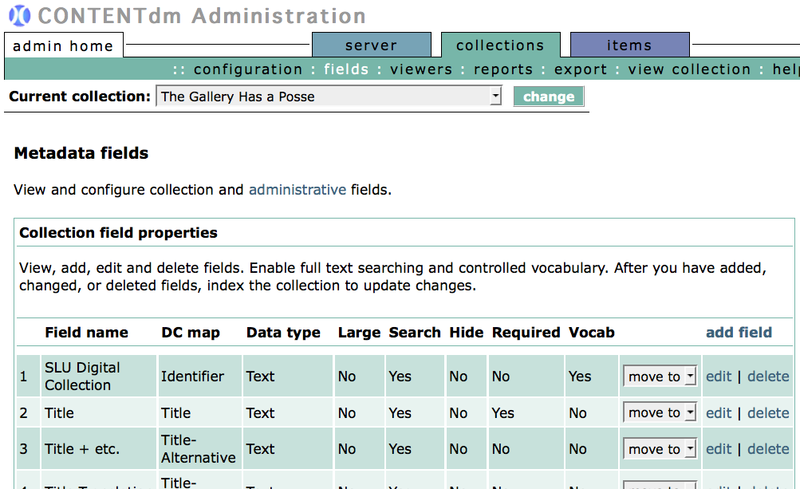 Here below is an image of the CONTENTdm software, in which I have created fields for metadata. I currently have 39 fields, but some of them are for the actual stickers and some are for the digital image files. With an online database (or even using old-style 3×5 cards), one needs to maintain information about the object itself (the actual stickers) as well as “information about the information” (i.e., metadata).